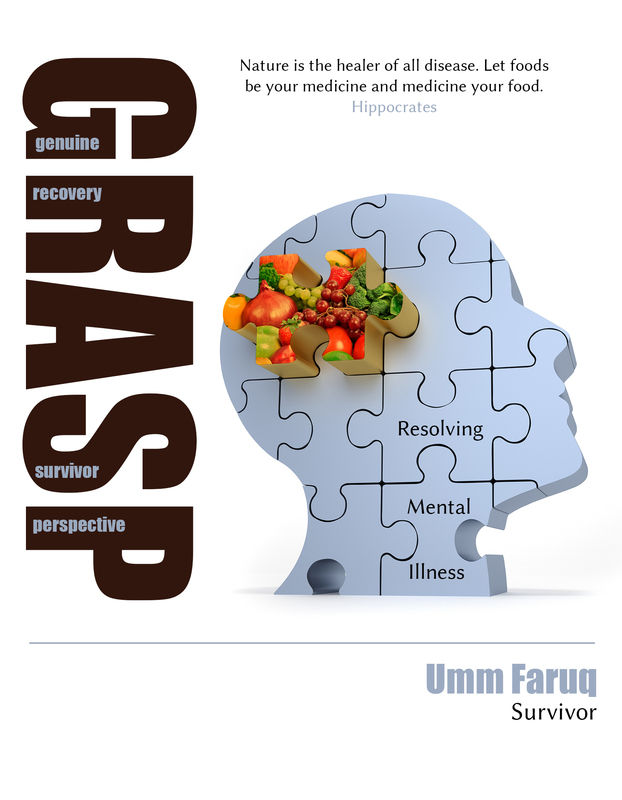 "GRASP offers important considerations of the nutritional and physical health status of an individual and its contribution to recovery and staying well." "The links between mind and body are so important and such a popular theme currently, so it feels the right time for such a book." "Umm Faruq's remarkable story of her strength and determination in exploring ways of maintaining her mental wellbeing without relapse for over nine years is both courageous and inspirational." "The science of nutrition and story of a woman’s battle against mental illness are combined with conviction into an enthralling read. Food cannot replace medicine, says the author, but controlling what you eat can help control your mental health. Whilst this is not a brand new concept, it is a gem of knowledge unearthed and updated with reference to empirical data and scientific research. The result is a valuable reference source remarkable in its accessibility, with complex scientific concepts made crystal clear through vivid metaphors and everyday language". "A magnificant text book manuscript; the message of the book is very clear, well argued and very well researched." "Umm Faruq makes the case that nutrition should be given a place alongside prescribed medication as a biological treatment for mental illness." "Reading GRASP has helped me; I am feeling a lot better and have hope for the future...I have control over my life again." "This book is unapologetic and honest as it lays to bear every bit of science, personal and social aspects of what make us the people that we are and why we may behave the way that we do. In Umm Faruq’s book, genuine recovery, a survivor perspective (GRASP), she details her personal journey, her experiences, and triumphs over adversities. It is very much a resource/research book for everyone; service users, carers, mental health professionals and the general public". Order online now to secure YOUR copy!